A team of scientists from the Institute of Biochemistry, Faculty of Science of the MU, a member of which was also MSc. 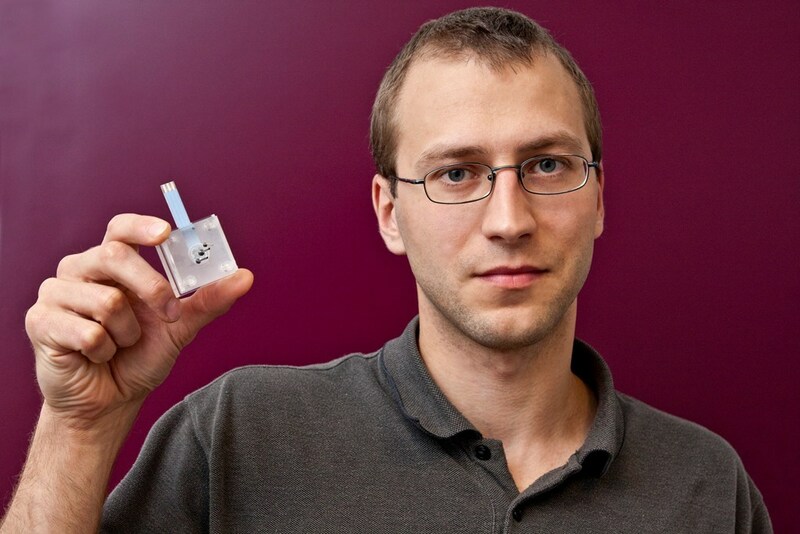 Karel Lacina, created in cooperation with the Brno University of Technology a new invention that makes life easier not only in the lab – a device for even distribution of liquid flow into several channels for flow analysis. The solution has great potential for application, a fact that is proved by selling the license to the company of Ing. Milan Jílek. The invention was born under the project Bioelectronic Tongue for Wine Characterization, a goal of which is to create a simple and functional analytic device for determination of sugars and acids in wine. “For this purpose, we needed a lab device that ensures even distribution of liquid into several channels that distribute the liquid to detectors. Another issue was to ensure that the detectors would not interfere with each other. Currently used solutions do not provide results of desired quality, so we decided to design our own detection cell,” states Karel Lacina. During the designing of the architecture of the invention, the team joined forces with specialists from BUT, especially Ing. Jiří Vondál from Faculty of Mechanical Engineering. The result of the cooperation is a reliable multi-channel measuring system, where the liquid in each channel can be analyzed for certain parameter. The novelty of the solution lies a priori in the way of dividing the liquid – i.e. in using channels of equal length – and in connecting the collection chamber to the channel outputs. Very beneficial fact lies in the use of exclusively passive parts, absolute separation of the detectors and easy connection of the detection cell into already existing systems. “Although it is a multi-channel system, we designed a solution where the inlet and outlet are single. Thanks to this, no problems occur when connecting this device to existing instruments. The invention is usable in electrochemic detection (potenciometric, amperometric, voltametric or conductometric sensors), optic (photometric, fluorimetric or luminometric sensors) or others,” Karel Lacina adds. Other advantages are simplicity, robustness and low manufacturing costs. When testing the detection cell, the team realized the big commercial potential in many fields, like clinical biochemistry, food and beverage industry or agriculture. They contacted the Technology Transfer Office of the MU and announced an invention. The TTO specialists performed analysis of applicability, the result of which was a Czech patent application in December 2010. “The TTO employees helped us greatly in the patent proceedings, took care of all the administration and related formal issues. Our team could therefore fully devote to testing of the invention,” Karel Lacina says. A commercial application of invention named “device for even distribution of liquid flow into several channels for flow analysis” proved itself in practice soon. A company led by Ing. 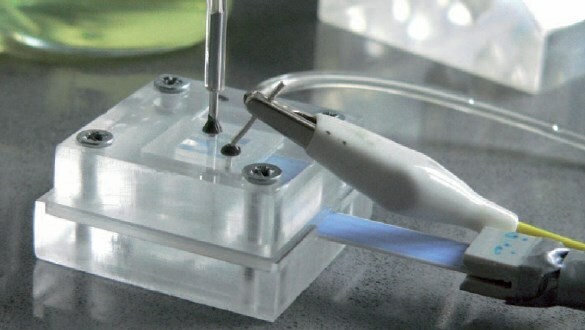 Milan Jílek, focused on biosensor manufacturing, that has been cooperating with the Institute of Biochemistry for some time before, expressed interest in the invention. “Our company has a twenty-year history on the market. 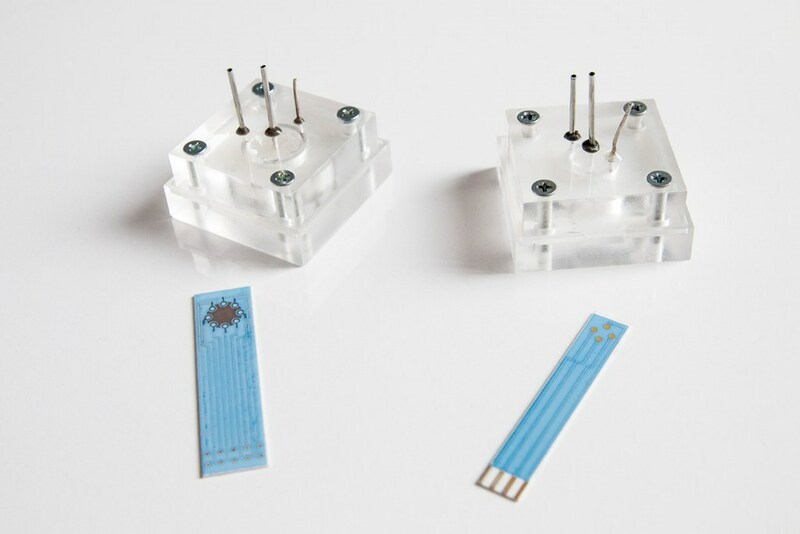 We sell bigger series of biosensors and we have a large network of contacts on the companies manufacturing devices where the sensors can be applied. So far, we used only twochannel biosensors, but the new cell can measure four analytes at once, and potentially even more. Thanks to this and also to its reliability and simplicity, the solution interested us and we decide to purchase a license from MU,” Milan Jílek explains. The license is important for the company especially because it receives a completed and proved device. “We needn’t perform development and lengthy testing, and that means a great save of time and money for us. The properties of the detection cell and its applicability in many existing devices brings along interesting options to enter other markets. All that with a minimum need of administrative work – in all necessary steps we are helped greatly by the TTO MU,” Milan Jílek concludes.